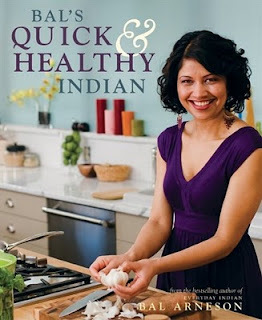 Bal’s Quick & Healthy Indian (Whitecap Books) is not just another Indian cookbook. And though author Bal Arneson’s first cookbook, Everyday Indian, was given international attention, Arneson lives in Vancouver, where some really terrific Indian cookbooks have already been published. Arneson’s book, though, isn’t just that. Or maybe it’s more. Which, in a way is only to be expected. The food she creates -- both in this new book and on her Food Network television show, Spice Goddess -- reflects all of these things. Absolutely traditional Indian reimaginings of foods you would be unlikely to find in India. Coriander Tuna with Broccolini. Spiced Sweet Potatoes Cooked with Split Red Lentils. Sweet and Sour Chickpeas. BBQ Chicken on Steamed Bok Choy served with Strawberry and Kiwi Salad. And the absolutely fantastic, super Indian and perfectly un-Indian Stir-Fried Sirloin with Figs and Spinach. Like many of Arneson’s recipes, this last is incredibly simple and uncomplicated. A masala is created and cooked. Sirloin is added and seared. Figs are introduced to the mix. Spinach and rice are steamed (though not together) and then the whole thing is plated and served. And you’ve created a beautiful and nutritious meal that could be proudly served to guests in very little time. Many of the recipes include some nutritional facts and -- most unusual in an Indian cookbook -- many of the dishes include wine pairing suggestions.